You might have wondered what food to eat if you are a diabetic. This has always been a cause of confusion among people. Diabetes meal simply means eating the healthy food in a regular fashion. The diet for diabetes is enriched with nutrients and low in calories. The best foods for diabetes patients is wholesome food which is not processed like fruits and vegetables. Incorporating healthy food into your daily meal can decrease your risk of diabetes mellitus. Regularly sticking to your diet plans can help you improve the blood sugar level. Why do you need a healthy diet for diabetes? Yolanda Adams has said “Good Food is healthy food. Food is supposed to sustain you so you can live better, not so you can eat more. 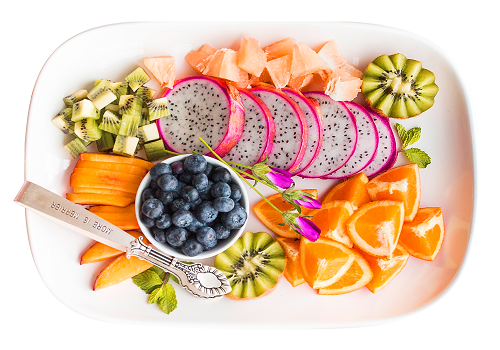 Some people eat to live, and some people live to eat.” You need a balanced, nutritional diet that could be really helpful in reducing the sugar level. If you are a diabetic, then your doctor will surely recommend you to get a dietician who will create a proper diet plan to develop a healthy diet. The diet will help to control you lose weight, reduce sugar level, and also control symptoms of heart problems. When you eat unhealthy food which is high in calories and fats, the glucose level in your body tend to rise, resulting in some grave problems. If your blood glucose level is not kept in check, then there is a high risk of hyperglycemia, kidney damage etc. Since, one of the side effects of diabetes is weight issues also, there is an important need to eat healthy food. Salads and leafy vegetables offer the high nutritional value to your diet which also work effectively in reducing body weight. Also Read: What are 5 wholesome grains for diabetes? 1. Apples: There is a very popular saying, “An apple a day keeps the doctor away”. Studies have found that regular intake of 1 apple reduces your cholesterol by about 40%. Apples are generally linked to reduce type 2 diabetes mellitus.Apples are fulfilled with fibers and antioxidants. Researchers have found that pre-diabetics who have taken an apple regularly even keep people away from diabetics. You can make apple juice and drink it. Simple Carbohydrates: They are usually called Simple Sugar which are found in refined sugars(white sugar). Most of the chocolates or toffees contain simple sugar. Complex Carbohydrates: They are also composed of sugar. The only difference in them is that they are bound by a more complex chain. They are usually refined. Grains, Peas, Green Vegetables, starchy vegetables are some of the complex carbohydrates. Foods that are rich in carbohydrates and are healthy for diabetics are low-fat dairy products, beans, lentils, fruits etc. 3. Eggs: Eggs are an amazing food for keeping your blood sugar level low. Eggs have the least amount of carbohydrates, due to which they have a low glycemic index. One egg can keep you full with lowering the rate of carbs in your body. Regular consumption of eggs is also helpful in preventing you from heart diseases. According to a study, the patients with type 2 diabetes who take 2 eggs everyday have shown tremendous changes in their blood sugar levels. It is important to eat the yellow part of an egg which is called yolk because it has all the nutritional value. White part(albumin) is not that healthy. You can make scrambled eggs or in sunny side up way. 4. Fish: Fishes are the great source of healthy fats. They have less amount of saturated fat and cholesterol as compared in meats. It is also a high source of proteins which keeps you full and helps in reducing the sugar level. Fish also contains omega fatty acids that are very effective in improving the heart problems. Salmon, Tuna, or cod are some of the fishes that have less total fat and cholesterol level is also low in them. 5. Blueberries: Berries are highly packed with antioxidants, vitamins, fibers which help in reducing the glucose level from the body. They have a low level of carbohydrates density which also have an anticancer effect. They have anthocyanin which is the reason that blueberries are blue in color. They also have anti-inflammatory effects which fight heart problems. One cup of blueberries regularly is sufficient for you to help in managing your sugar level. Cholesterol: Food items that have the high level of cholesterol like ghee, butter, full-fat cheese, milk, red meat etc are some of the food items that should strictly be avoided if you are diabetic. These food items work dangerously in raising your glucose level. Cholesterol is extremely dangerous for diabetics. Excess consumption of cholesterol could be extremely fatal for health. Sugary Foods: Sweets, desserts, chocolates etc are usually made from processed sugar that has low-quality carbohydrates, and also lack in nutritional value. Consuming these foods might exacerbate your diabetes. White Bread and Rice: White bread and rice are highly composed of sugar, which increase your glucose rate. They are refined starches and harmful for people who are diabetics. Instead of white rice and bread, it is advisable to eat brown bread and rice which has low sugar and helps in controlling diabetes.